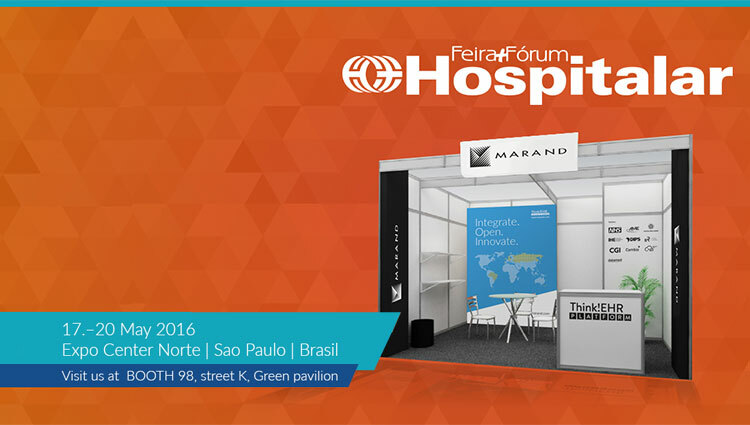 Marand will be showcasing its leading Think!EHR PlatformTM at the Booth Rua K / 98. Meet us there to find out how our “Integrate. Open. Innovate.” approach is being used to build truly postmodern EHRs in South America, too. Marand has been present in South America for several years. A key client who started working with us in the last year has been hospital Sírio-Libanês, a top Brazilian healthcare provider who decided to use our Think!EHR PlatformTM in order to centralize and integrate all its clinical information in a vendor-neutral structured data repository. With Think!EHR PlatformTM, our clients are capable of creating postmodern EHRs—modular clinical information systems which are open and agile, where they’re free to introduce, renew or replace any apps they might require to support their clinical needs, be it on premise or in the cloud, while at the same time integrating all devices, and connecting patients and doctors in ways unobstructed by rigid and costly architectures of monolithic, closed EHR systems. Since April 2016, Think!EHR PlatformTM has also been the first eHealth platform to combine IHE's standard document exchange with structured health data based on openEHR. This enables governments, healthcare providers, ecosystem enablers, vendors, SMEs and other healthcare providers to get the best from both worlds, namely the ability to connect to any IHE/HL7 compliant software and to work with fully structured clinical data. Visit our booth to find out what healthcare providers and vendors can do to become more agile and open, while at the same time ensuring that the IT systems, apps and solutions are built to support the longevity and integrity of patient data.